Mary his wife, was born and raised in Millstone. She has been his trusted business partner for the last 30 years. Nick was so happy to see his dream come true. Their 4 children, Lou , Anna , Frank & Theresa have also worked in the business with their parents & have always shared their ideas & contributions to the family business. Our Family appreciates the patronage of its customers. The promise of our family to our customers is to always serve the best quality food at affordable prices. 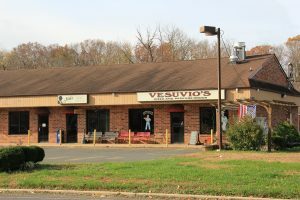 So, come to Vesuvio’s Pizza & feel like a part of the family! We hope you enjoy our generous portions & friendly, courteous service!